A friend recently expressed an interest in how some cities are reforming their land use regulations. “I mean, there are places like LA that say they’ve thrown out the code books and are rewriting their zoning.” My short response was… No. The reality is that the city plays an expensive and byzantine game of cat and mouse with each individual neighborhood. There’s a little sliver of brassiere shaped land wedged between the Los Angeles River and the Golden State Freeway that sums up a lot of what constitutes the land use regulation process in LA. When poor Mexicans were forcibly removed in order to build Dodger Stadium in the late 1950’s they resettled in this inexpensive semi-industrial zone called the Elysian Valley, which is also commonly known as Frogtown. It's been a solid working class neighborhood for decades. Families have long managed to own modest homes and live in respectable obscurity among the auto body shops, plumbing supply warehouses, and municipal maintenance facilities. In recent years the adjacent neighborhoods of downtown Los Angeles, Echo Park, Silver Lake, Atwater Village, and Glassell Park (all previously ignored and undervalued) have become newly fashionable and prohibitively expensive. Pent up market demand acts like a balloon – if you squeeze the middle the ends bulge. In this case home buyers, renters, and businesses have scoured the area looking for alternatives. Frogtown is a centrally located and relatively affordable compromise. Design firms, architects, photographers, tech incubators, high end specialty fabricators, and other such enterprises have moved in to the nondescript buildings of Frogtown. If you’re willing to celebrate concrete block walls and corrugated steel as honest industrial materials you can create the trendy Dwell look with paint and landscaping on the cheap. Compare this process with the expense of restoring a more exotic historic property in a tony neighborhood. Art Yanez is a Los Angeles native and the son of immigrants. He’s also the principal of FSY Architects. He purchased three contiguous parcels in Frogtown and created a campus for his firm. The space incorporates pre-existing industrial warehouses as well as new construction with shops and offices that are now rented for supplemental income. The architecture firm’s own offices are currently oversized to accommodate anticipated expansion as business continues to ramp up. But construction is a cyclical industry, so the space can be subdivided and rented during future downturns. The new building achieves the legally required off street parking standard as well as the fire marshal’s demand that a full size fire engine be able to drive around the entire structure in an emergency. The parking is convenient (this is Los Angeles after all), but the outdoor space does double duty as a plaza for human activities on occasion. Strings of cafe lights, movable furniture, potted plants, and people transform the place quickly and easily. Part of FSY’s strategy was to create a place that would activate the entire community, not just a building containing offices. 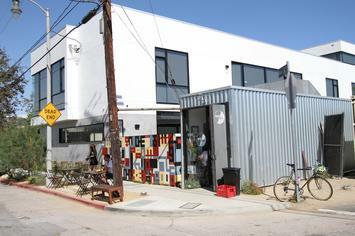 The initial concept involved repurposing shipping containers and pressing them into service as small shops. The building code wouldn’t permit that so a stick built version mimics the container look and scale. Actual containers are parked in back and are used for low cost storage. Local artists were invited to install distinctive motifs for the exterior of the corner cafe. All of this was as-of-right construction within the established city code. For the last century the Los Angeles River has been a concrete industrial drainage canal sealed off by barbed wire fences and cinder block walls. Most people in LA have no particular relationship to the “riverfront.” But that’s changing as city officials have announced a billion dollar program to transform the river into a ribbon of green and blue public amenities lead by none other than starchitect Frank Gehry. The success of small infill developments in Frogtown along with the city’s plans to transform the river have attracted large scale production developers. Previously ignored sites began to sprout upscale apartment buildings and condo complexes on dead end streets at the river’s edge. This process was viewed with scorn by existing property owners and community organizers who haven’t forgotten how their families were bulldozed to make way for Dodgers Stadium. So they lobbied for new regulations to make it harder to build anything new and to work around the perception that political figures are corrupt and on the take for developer’s money. The new regulations now make projects like Art Yanez’s building non-conforming and subject to special review processes for height, bulk, and so on. The result is that now only very small projects can be built as-of-right, and only very large and expensive projects can overcome the newly implemented regulatory hurdles. All the incremental in-between projects that might have been built are now much less viable and far more expensive to push through. This is what land use policy actually looks like on the ground.